The name “Peale” is synonymous with the First Family of American painting. The painters of the Peale family were the first “dynasty” of American art, and what a dynasty! They established norms of subject matter and style when the American painting school was in its infancy. However, mostly the Peale men are discussed in art history texts, because that’s just what most art history texts do: ignore most women artists. Many are familiar with Charles Willson (1741–1828), the patriarch of the dynasty; his brother James (1749–1831); Charles’ sons Rubens (1784–1865), Raphaelle (1774–1825) and Rembrandt (1778–1860); and even the cousin Charles Peale Polk (1767–1822). Rarely are the daughters, nieces, and women in-laws who were also professional painters mentioned in art history books. They were definitely pioneers of the American painting school like their male Peale dynasty counterparts. Here are four of them. Anna Claypoole Peale played an important role in the cultural development of Philadelphia in the early 1800s. She was the daughter of James (the brother of Charles Willson). Trained by her father, Anna sold her first two paintings—copies of French landscapes—at the age of 14. Peale was born and spent most of her life in Philadelphia, although she also made trips to Washington, DC; Boston; Baltimore; and New York to fulfill portrait commissions. Although after 1823 she relied primarily on commissions for portrait miniatures, she also continued to paint full-scale portraits, landscapes, and still life. In 1824, Peale and her sister Sarah Miriam were the first two women to be elected members of the prestigious Pennsylvania Academy of Fine Arts. Between 1824 and 1842 Anna’s reputation was such that she had more commissions than she could comfortably handle. She retired from painting in 1841 after her second marriage. Still life subjects came into their own during the first 25 years of the 1800s. Predominantly middle-class America was much the same as solidly middle-class Holland during the 1600s. Art patrons enjoyed works of art that celebrated familiar aspects of their lives. The painters of the Peale family helped elevate the genre into a first-class aspect of the American school of painting. 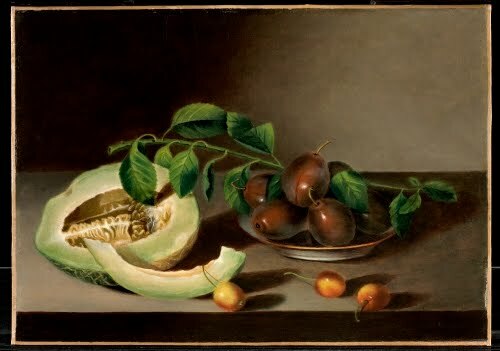 James Peale was known almost exclusively for his still life paintings, although he also did portraits. Margaretta Angelica, named (as Charles Willson did his sons) after famous artists: the Baroque still life painter Margerhita Caffi (1650–1710) and the Swiss Neoclassical painter Angelica Kauffmann (1741–1807), was the most accomplished of James’ children in still life painting. Trained by her father, she exhibited at the Pennsylvania Academy between 1828 and 1837, and is mentioned in their records between the 1820s and 1865. Like her father and cousin, Raphaelle, Margaretta Angelica used clear outlines and generalized forms. 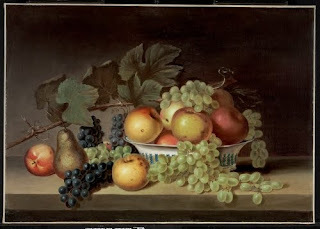 Characteristic of Peale family still life painting, the forms are arranged on a shelf parallel to the picture plane, with a diagonal light raking across the objects, the background lit from dark to light in the opposite direction. 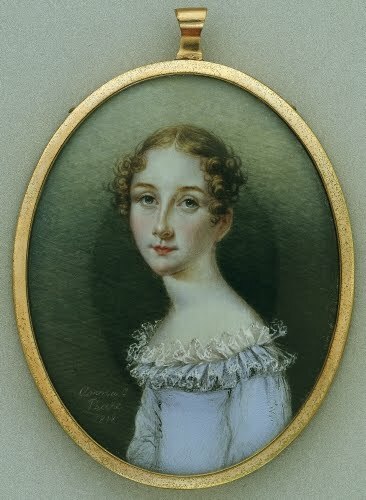 Anna Peale Sellers was the granddaughter of Charles Willson from his daughter Sophonisba Angusciola (1786–1859). Like many of the Peale painters, instruction was a family affair. She, too, learned the Peale style of still life painting. She was also an accomplished portrait painter, often copying the portraits done by her uncles or great uncle James. 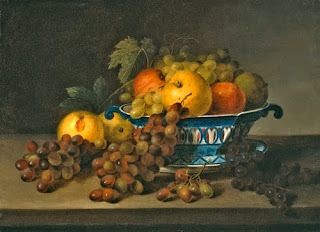 The similarity to James’ still life formula is striking, with the only difference being in the direction of the raking light depicted in the background. Like her uncle, her still life objects often show slight decay, much like many Dutch Baroque still life painters did. This is probably a copy of a James Peale work of 1825 now in the Munson Williams Proctor Art Institute. The composition was also copied by her uncle Rubens and aunt Harriet Cany Peale (1800–1860), wife (and student) of Rembrandt. Mary Jane Peale was the granddaughter of Charles Willson from Rubens. Her uncle Rembrandt was her first instructor, and she later studied with the Romantic portrait painter Thomas Sully (1783–1872). She was the last member of the Peale dynasty to work as a professional painter, carrying the Peale legacy into the 20th century. 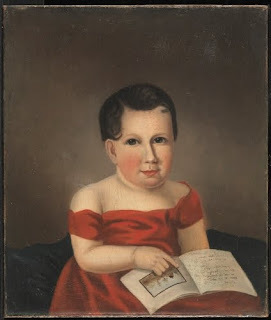 Her portrait of her older brother is probably a copy of an existing painting. An early work, it betrays a certain naïve quality not present in her later portraits. Although she may have referenced photography in her later portraits, I doubt she referred to a Daguerreotype in 1845, because the long exposure times of those early photographic portraits was often 30 to 60 seconds and would not yield such an animated pose. I want to have one on my room wall so much.